Thursday Night Storage: Store in a loosely closed plastic bag in the fridge. Extended Storage: Eat within 2 weeks, may get starchier over time. Thursday Night Storage: Remove green tops to store and use like green leafies. Store in a loosely closed plastic bag in the fridge. Extended Storage: Should last a number of weeks, but their sweetness will diminish. Beets will soften with long storage, use at first sign of softness. Thursday Night Storage: Store in a loosely closed plastic bag in the fridge. Before cooking, soak upside down in cold water to remove stow-away bugs. Extended Storage: Use within a week. Broccoli tends to keep longer than cauliflower. Thursday Night Storage: Store in a plastic bag in the fridge for up to a week. Thursday Night Storage: Store in a plastic bag in the drawer of your fridge. Can use Bok Choy leaves as greens, or add to bok choy dish. Extended Storage: Head cabbages will last weeks in your veggie drawer. If the outer leaves are wilted or brown, remove them, the inner leaves should be fine. If you cut one open, wrap leftovers tightly in plastic wrap and use within 2 weeks. Bok Choy will last a week, maybe two. Thursday Night Storage: Remove and discard green tops. Store in a loosely closed plastic bag in the fridge. Extended Storage: Should last two weeks or more. Extended Storage: Should last several weeks. Check for moisture and keep dry. Thursday Night Storage: Store wrapped tightly in plastic in the fridge. Extended Storage: Eat within 2 weeks. Thursday Night Storage: Leave the husks on. Store in a loosely closed plastic bag in the fridge. Corn’s sugar turns to starch when stored so eat quickly. Thursday Night Storage: Store in a sealed plastic bag in the fridge, away from apples and citrus. Extended Storage: Eat within a week, maybe 2. Thursday Night Storage: Wrap in towel and keep in veggie drawer in fridge. Or keep in a loosely closed plastic bag in fridge. Will keep one, maybe two weeks in fridge. Extended Storage: Eggplant can be cooked and will freeze well. Thinly slice eggplant into disks. Then spread on a baking sheet and bake until just soft. When cool you can freeze them between sheets of wax or parchment paper and have it all ready for Eggplant Parmesan any time of the year. Thursday Night Storage: Cut off the stalks where they meet the bulb. Stalks can be placed in a glass with water in the bottom, covered with a plastic bag and stored in the fridge up to a week. Store the bulb in a plastic bag in the fridge. Extended Storage: Use within two weeks. Thursday Night Storage: Store wrapped in the fridge, to prevent odors from spreading. Extended Storage: Will last 1-2 weeks (check often for moisture accumulation). Garlic scapes will last a month in a plastic bag in the fridge. Thursday Night Storage: Check for any with soft spots and use or discard immediately. Store in a cool dry place or on counter top out if direct sunlight. Extended Storage: Should last 2-3 weeks. 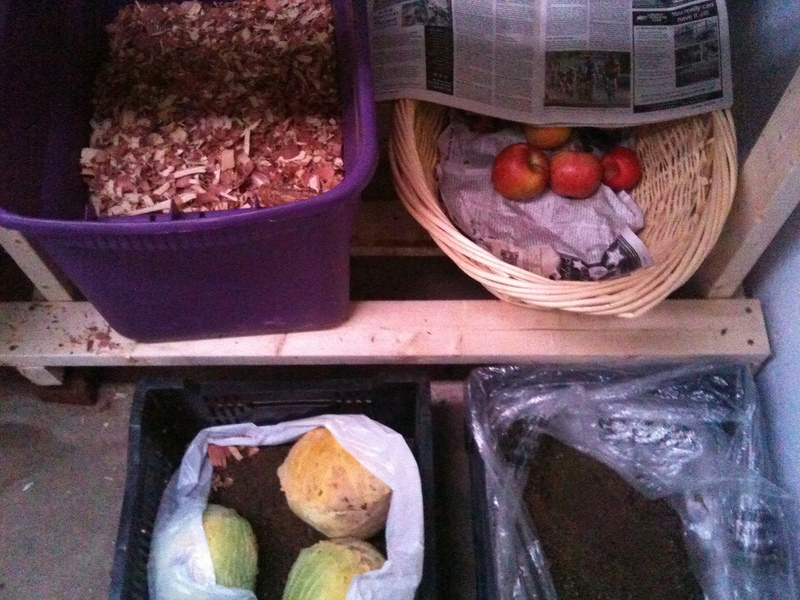 Can store even longer in Root Cellar – keep in a loosely closed paper bag, but check often. One bad onion can ruin the bag! Thursday Night Storage: Store in a loosely closed plastic bag in the fridge. Check often and use within the week. Wash only the leaves you will be using. Extended Storage: Greens should be one of the first veggies on your menu after Thursday’s pick up. Perhaps even Thursday night. Because John’s greens are usually fresher than those from the supermarket, you can sometimes save them for a week to combine with next week’s greens, but their quality will diminish. Hardier greens like chard and spinach can be blanched and frozen for extended storage – chop roughly, blanch for 2 minutes in a pot of boiling water, let it cool on a cutting board, chop it up and put it in a freezer bag. Pull it out in the winter and steam it, and use in any casserole or soufflé. Thursday Night Storage: Store in a loosely closed plastic bag in the fridge. You can add a paper towel to keep them dry. Use within the week (some last longer). Basil should be kept out of the fridge, with the bottoms in a glass of water. You can cover the “bouquet” loosely with a plastic bag, but keep the leaves dry! Drying (oven) – spread on a tray and place in oven on lowest setting with the door ajar. Stir occasionally. They are done when they crumble when pinched. Drying (paper bag) – poke a few holes in a lunch size paper bag. Tie small bundles of herbs together at the stalk and tie, hanging upside down in the bag. Hang the bag (or place upright) in a well ventilated, but not too cool location. Check daily for crumbliness. Should take about two weeks. Freezing – rinse leaves, chop coarsely, place 1 tablespoon in compartment of ice cube tray, add water to cover and freeze. Store cubes in a labeled freezer bag. Add cubes directly to soups, sauces, etc. Thursday Night Storage: Remove leaves to store and use like kale or collards. Store in a loosely closed plastic bag in the fridge. 2. Wash and cut up for salad on Thursdays. Dry well. Put only the salad greens in a Tupperware bowl, and put a paper towel at the bottom of the bowl, then put the greens in on top. It is best to NOT make a tossed salad ahead of time. Cucumbers and peppers, which are much “juicier” than say, carrots or salad turnips tend to make everything else in the salad go bad quickly. Extended Storage: Should last two weeks or more. Check for softness and use before they become soft and rubbery. Thursday Night Storage: Store in a loosely closed plastic bag in the fridge. Use within the week. Peas lose sugar content during storage, so eat these first. English peas and edamame have inedible shells, sugar snap and snow peas have edible shells. Fava beans – shell the beans, blanch the beans in boiling water for 1 minute, remove the outer skin from the beans before cooking and eating. Thursday Night Storage: Store in a plastic bag in the fridge. Roast long (Italia) red peppers: Cook close to the flame on a grill or gas stove top. Turn with tongs occasionally until skin is all black and charred. Cool. Rub skin off under running water. Seed and cut into strips. Store in a sealed container or marinate in herbed oil. Extended Storage: Use within a week or two, green peppers keep a little longer than colored. Wash and dry well any peppers. Then chop into pieces the size you use them. They can be frozen in plastic bags and used (straight from the freezer) in soups, stews, casseroles, stir-frys or anywhere else you would use cooked peppers. They still taste fresh! Thursday Night Storage: Spread potatoes on counter to dry overnight. Cover lightly with a towel to keep the sunlight off them. In the morning, remove any soft or bad looking potatoes. Extended Storage: Store the good ones in a loosely closed paper bag in the fridge for up to 2 weeks. This causes them to soften more quickly. Can store even longer in Root Cellar – keep in a loosely closed paper bag, but check often. One bad potato can ruin the bag! Thursday Night Storage: Remove green tops to store and use like green leafies. Store in a loosely closed plastic bag in the fridge. Should last two weeks. Thursday Night Storage: Store in a loosely closed plastic bag in the fridge. Use within the week. Extended Storage: Shredded or grated zucchini/yellow squash can be frozen in the amount you use for zucchini bread. Just defrost and add to your recipe. Thursday Night Storage: Store in a cool dark place. Do not refrigerate. They do not keep as well as white potatoes. Extended Storage: Use within a week, check for soft spots. Can store even longer in Root Cellar – keep in a loosely closed paper bag, but check often. One bad potato can ruin the bag! Thursday Night Storage: Do not refrigerate unless extremely ripe. Keep on the counter out of direct sunlight.Depending on ripeness, tomatoes can last a week or two, some (heirlooms) need to eaten immediately. Extended Storage: Ground cherries can last weeks on the counter. Wash tomatoes and dry well (can use a dehydrator). Then dice them and mix with some herbs. Freeze in freezer container. Defrost and sauté with or without other veggies for serving over pasta. OR make tomato sauce and freeze. Thursday Night Storage: Remove green tops to store and use like green leafies. Store in a loosely closed plastic bag in the fridge. Store in a loosely closed plastic bag in the fridge. Extended Storage: Salad turnips should last two weeks. Winter turnips should keep for a month or more, check often. Thursday Night Storage: Rinse and Dry. If very wet leave on counter overnight to dry. Check for soft spots. If there are any, cook now. Extended Storage: Should keep a few weeks at room temperature. Will keep much longer in a root cellar: Don’t let squash touch each other. Check for soft spots often. Winter squash can be roasted and mashed or pureed, then frozen in any quantity for breads, pies, casseroles, etc. Many foods used to be stored all winter in a root cellar. Today, because of supermarkets and modern refrigerators, most houses do not have a root cellar. However, there are places that can approximate a root cellar. Any place in your home that does not freeze, is relatively dry, and provides some ventilation will do. Suggestions are: cool, dry corner of an unheated basement; attached garage, against the wall shared with the house, unheated room in the house. Keep foods in your root cellar on a table or tray. Keep them separate from each other so if one goes bad it won’t spread to the others. Check your food often for signs of spoilage and use or discard immediately as needed.